Indonesia’s intrinsic diversity is what makes traveling here captivating. It’s a place that’s easy to drop all expectations and just be amazed by what is waiting to be found. Every region of the country has its own unique cultural composition and this diversity defines the country. Numerous native ethnicities can inhabit one island alone and increasingly moderately reliable transport means each island is also increasingly influenced by its place in the vast, eclectic conglomeration of islands comprising it. Green volcanic mountains sprawl across the coast landscapes dotted with predominantly Minihasan villages, towns and cities in North Sulawesi. Here some of the island’s most important parks and reserves fight against increased population and development as deforestation and poaching continue to feed families. 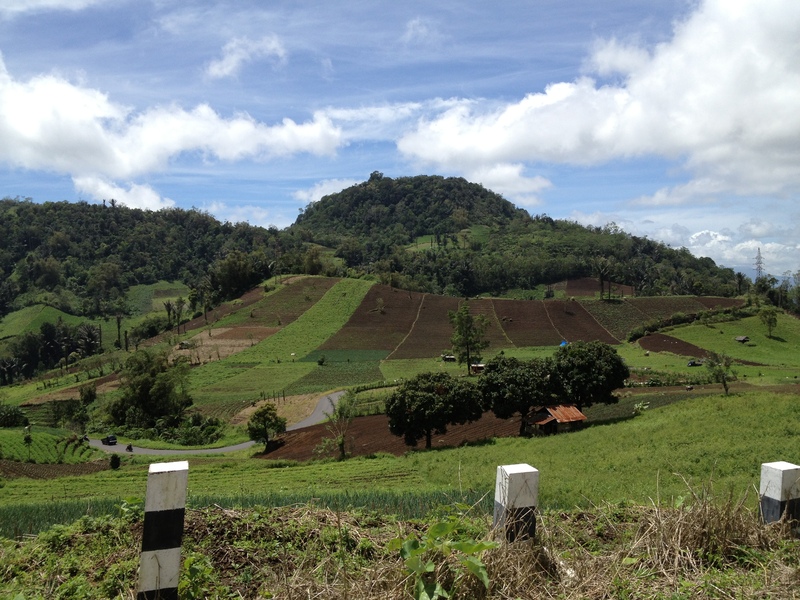 Each of these factors is evident as our bus winds up the steep volcanic landscape on roads which are pleasantly well maintained for Indonesian standards. While palms, flowers, and picturesque vistas abound; shops, restaurants, schools and homes also continuously line the roadway. During the colonial period the north was an important political and economic center for the Dutch. By and large, the local Minahasan embraced Dutch rule. During the chaos of the late fifties and early sixties, when the Indonesian state had been established in the West while the Eastern islands grappled with power struggles; Sulawesi was largely controlled by competing warlords. At this time, the majority Minahasan population favored the stability and prosperity of Dutch rule. Local leaders from the north unsuccessfully petitioned the Dutch to become a protectorate state. Without Dutch support the Minahasan fought the expanding Indonesian government for sovereignty and were only defeated when Indonesia launched a major military campaign that lasted 5 years and included the aerial bombardment of Manado. After 59 days in Sulawesi our curiosity of Indonesia’s diversity had only heightened and we were embarking on one last immersion into its beautiful and strange culture and landscapes. 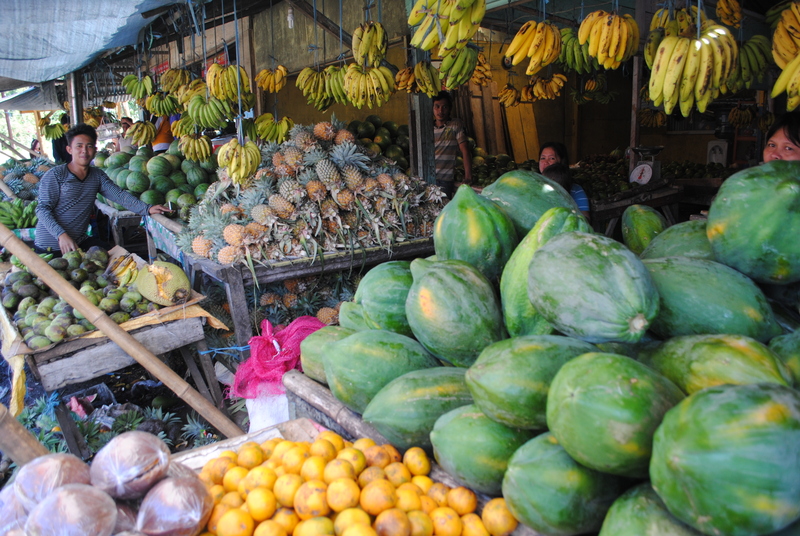 Our journey through Sulawesi was ending in the North and for an authenticly weird final day we decided to check out the market in Tomohon as well as climb a volcano or two. 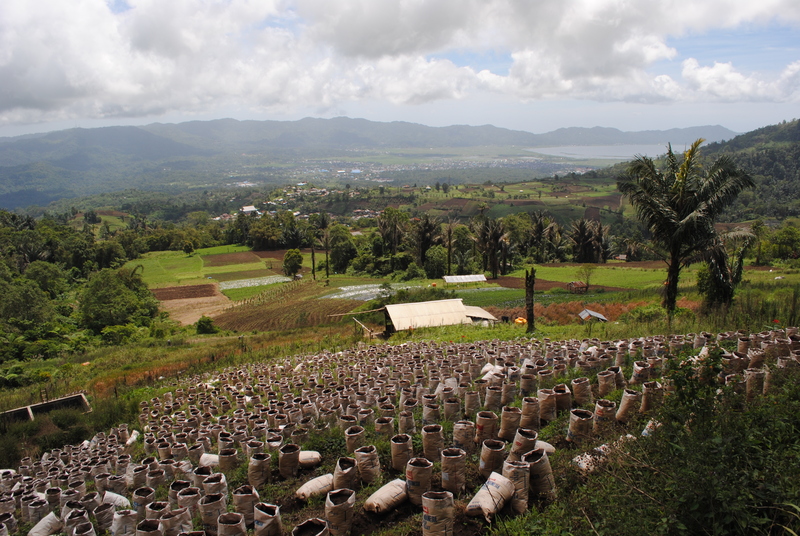 Tomohon itself is an attractive midsized town perched on the hills below Gunung Lokon Volcano. 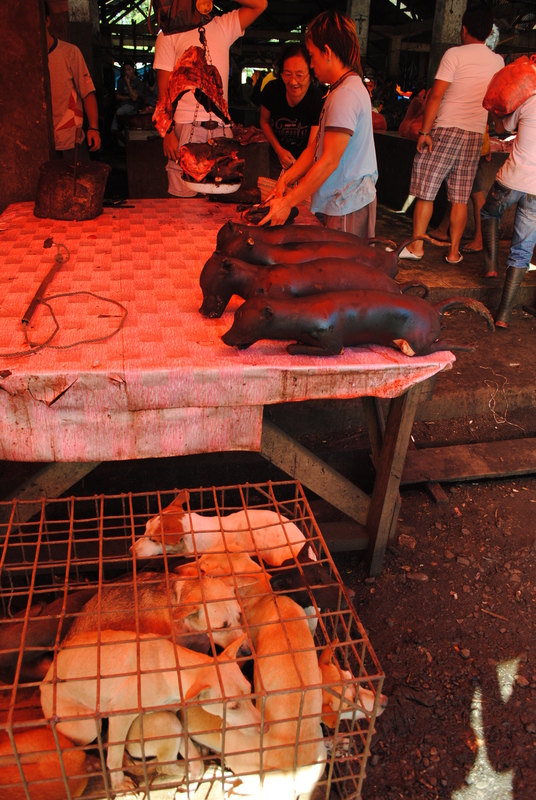 Like nearly every town in Southeast Asia, Tomohon’s bus station is located adjacent to its bustling market. While this convenient placement makes a logical location for buyers and shoppers, for the traveler this means your introduction to a town typically begins smack in the middle of its two busiest, most chaotic landmarks. However, today it was the market itself we were here to see. 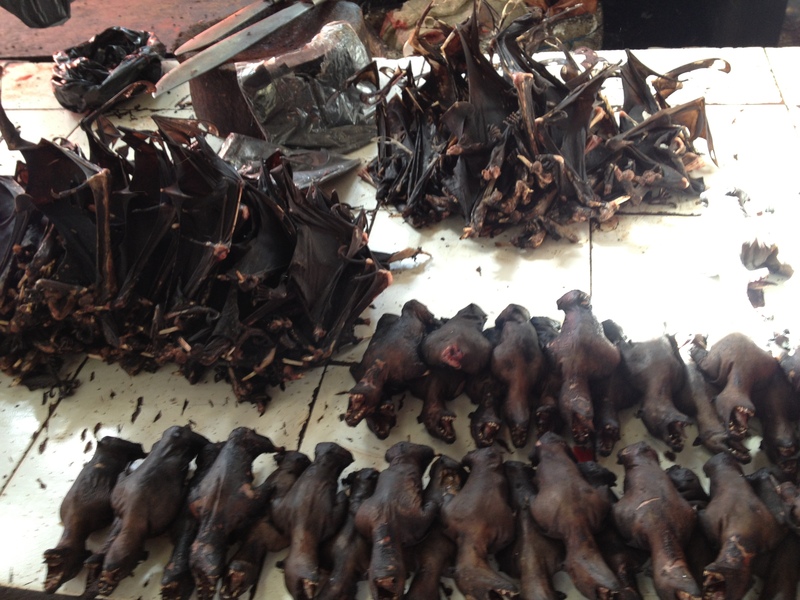 In many respects Tomohon’s market is like any other. Up and down the street underneath torn, flapping blue, black, and gray plastic tarps sellers crouch among their neat piles of wares spread out across mats or hanging overhead; dried red chilies, machetes, rubber boots, live chickens clucking and bound together in packs of three, bras, squid, brightly patterned headscarves, and produce everywhere- banana, rambutans, pineapple, durian pumpkin, mango, eggplant, heaps of herbs. Entering the narrow lanes between stalls the nose is berated with the noxious smell of dried fish, livestock, and soggy garbage. At eight in the morning it is not a place to ease into the day. 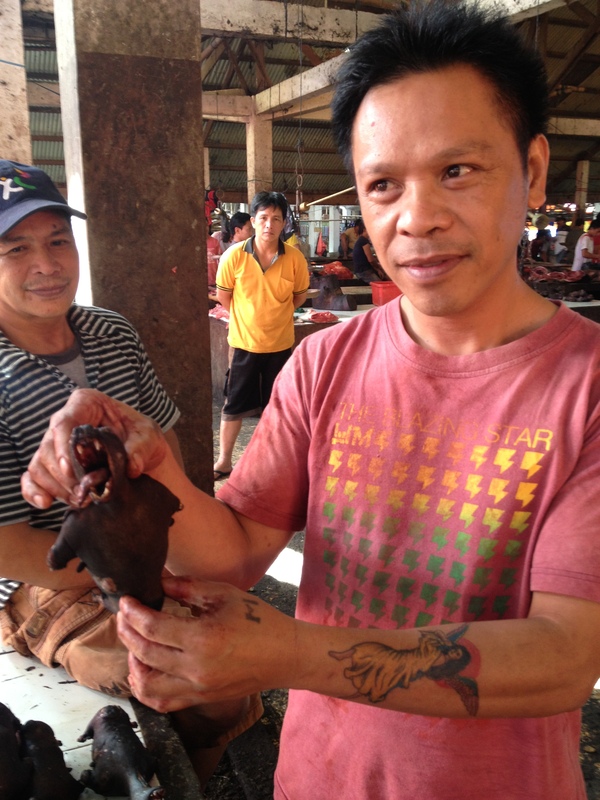 The meat selection is what sets Tomohon’s market apart. We heard about its diversity first from our guide in Tangkoko Nature Reserve, also in North Sulawesi. The Minahasan people (possibly Indonesians generally) are known for intriguingly diverse diets including many creatures from their ever depleting forests. Unfortunately, their appetite for game is rapidly vanquishing the wildlife from their few remaining forests. Walking through white tiled stalls the scene grows increasingly macabre. A pile of pork, a rarity in the predominantly Muslim south, is swarmed by a cloud of flies and flanked (no pun intended) by a border of hooves. Walking further the meat counters become increasingly unsettling. A man holds a metal stake of skewered bats over a blowtorch. 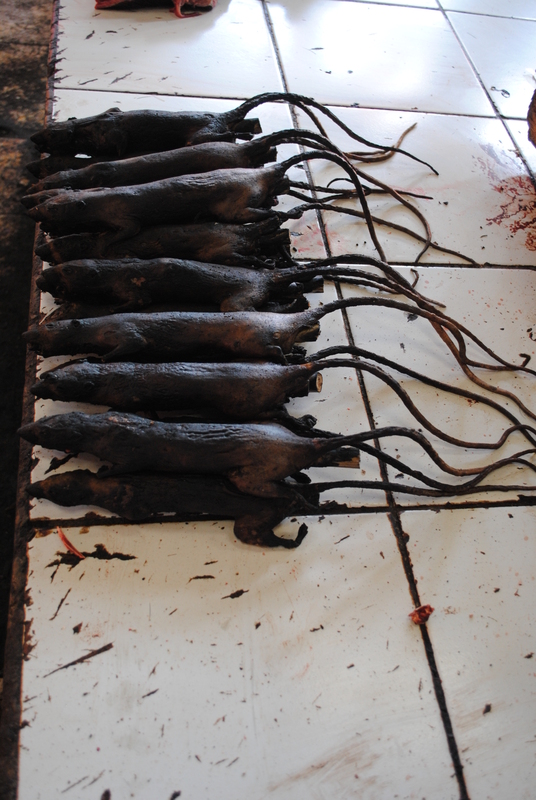 Next to him a pile of charred rats is only distinguishable by their long crispy tails. 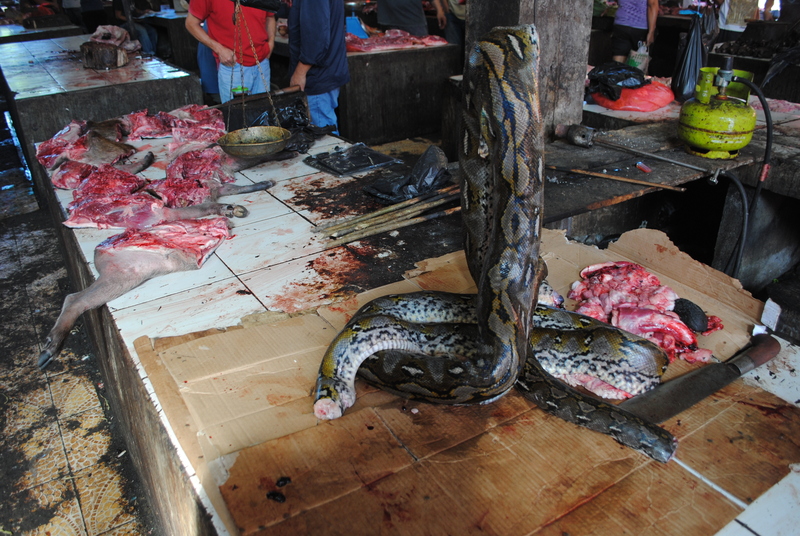 A massive python partially divided into thick cutlets is coiled upward around a specially made stand. Presentation is everything in the meat business.Most disturbing to our western mindset are the dogs. A dozen yelp from their cage beneath a table of blackened ones. We didn’t linger to see if there were any monkeys. Despite being endangered and illegal, monkey is an exceedingly popular delicacy with the Minahasans particularly for Christmas dinner. Instead we left the market for two activities that are staples of an Indonesian journey; an ojek ride to a nearby volcano. An ojek is a motorbike used for public transportation in Indonesia. With the exception of renting your own, an ojek is the most enjoyable, convenient, and affordable way to travel short distances here. Breathing in the fresh highland air and feeling the coolness of the upland winds in our faces, we whizzed by terraced vegetable gardens that descended into the distant valley and sparkling Lake Tondano encircled by volcanic peaks on our way to the rim of Gunung Mahawu. We had to walk the last kilometer to the top of the volcano, a bit of a chore for our legs which were recovering from a month of beachside inactivity. The aging bus we departed on that afternoon included pleasant amenities. The partially blown subwoofers above each seat blasted a combination of Indonesian love ballads and profanity laced English techno whose lyrics were thankfully indecipherable to the aging women and young children packing the seats surrounding us. The bus’s internal environment was however saved by the lush countryside fluttering passed the windows as we descended towards the coast. You know you’ve reached Manado when you spot Jesus. One of the most obvious signs of the Dutch legacy in North Sulawesi is the predominance of Christianity. At 97% of the Minahasan population (68% of the total population), this is the most Christianized region in Indonesia. While their beliefs differ from the country’s Muslim majority, the piety and emphasis the people here place on religion is characteristically Indonesian. 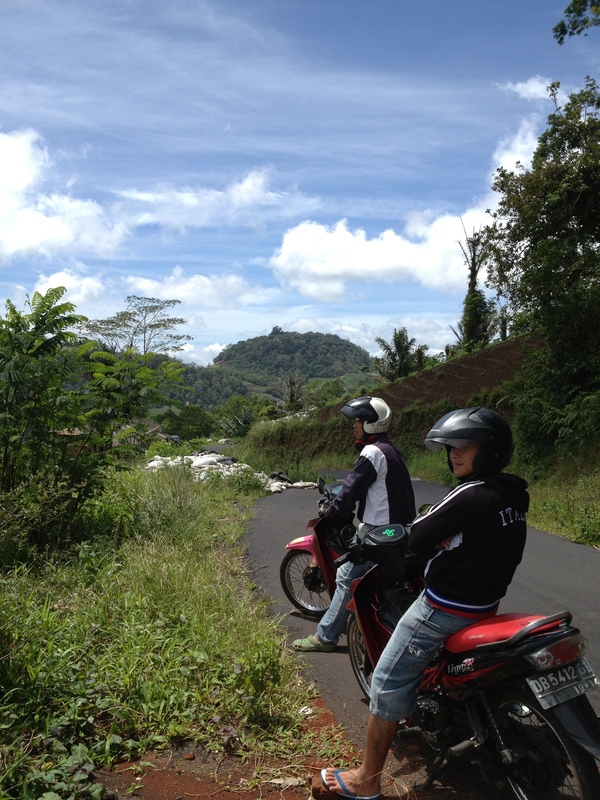 There is approximately one church for every 100m of road in North Sulawesi. Travelling around, the sounds of call to prayer are replaced with hymns, church bells, and prayer groups which not restricting themselves to the Sabbath are a constant presence in Minahasan Indonesia. 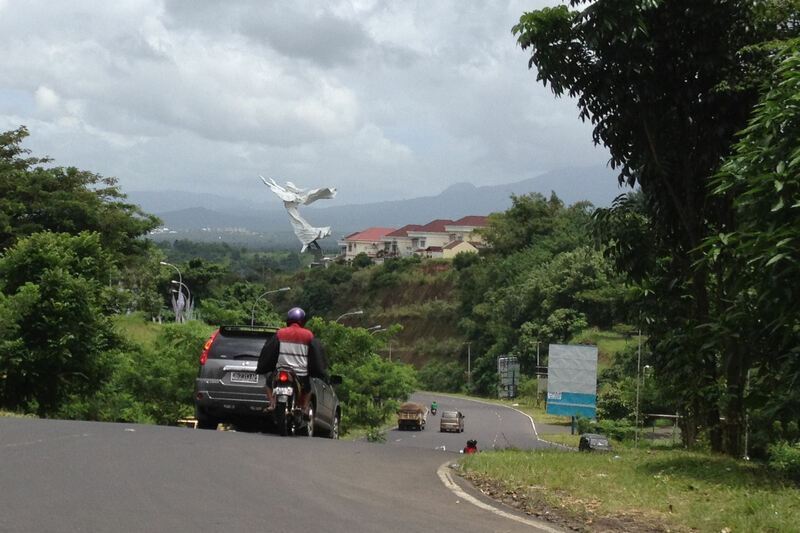 The region’s most ostentatious representation of piety is visible upon entering Manado from Tomohon where a particularly affluent private resident constructed the world’s largest flying Jesus. While looking back on my Sunday school days, I don’t recall any occasion where Jesus flies in the Bible, but he sure seems to fly here in Manado. Actually with his hands seeming to flail in the air, poor Jesus looks rather like he’s been flung off the steep precipice overlooking the city (maybe it would be a better fit in Aceh).